Today’s post is the start of another Series for MissAl-Leigh.com – Try This! Try This! will be posted on Thursdays, as often as I can get them out. TT will basically be Hauls with products I think are worth mentioning, first impressions of Samples, full product reviews, or even an exciting activity I think you should try. This first video is a Winter Haul covering some products I’ve purchased or been gifted over the Winter season. This doesn’t cover everything as I cut out quite a few products in order to shorten the length. Let me know in the comments, how long do you prefer vlogs to be? Are you willing to watch a 10+ minute video, or is 10 minutes, or less all you have time for? Please let me know your thoughts on the Try This! Series & this Haul especially. I thought of this like an overview of my “Winter Purchases”, so I wanted to wait until Winter was officially over, but would it have made more sense to do this video earlier? Please discuss in the comments below. I hope you enjoy the video, thanks for watching, & please remember to SHARE, LIKE, COMMENT, & SUBSCRIBE! 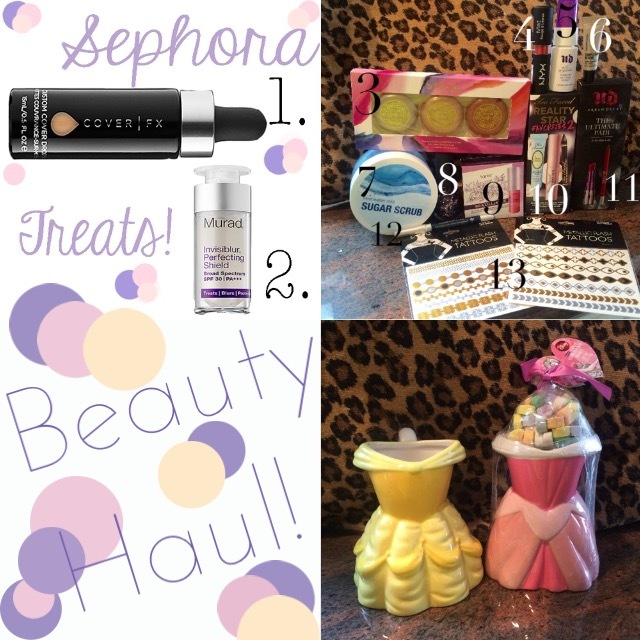 Beauty Haul! Sephora Treats! Ulta & Target! I TOLD you guys I have a shopping problem shopping solution! 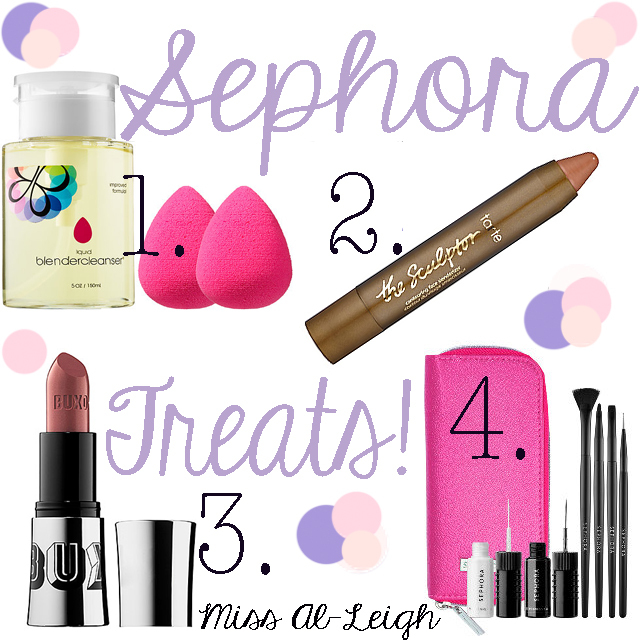 Here’s another package of Sephora treats I got in the mail that I’m excited to test out! I also went to Ulta and picked up some things & got some great free gifts! The two Princess mugs are from Target – EXTREMELY hard to find. They were part of the Valentine’s Day merchandise, hence the Convo Hearts, but sold out super fast! I don’t believe they are being sold anymore, not even in the clearance section. My mom was able to find these on Ebay. I’ve seen people use them to hold makeup brushes, but I already have brush holders, so I’ll have to find some other makeup related use for them! Here’s a list of the products featured here. Click on the links to purchase them for yourself! I think I’m going to use the “Murad” & “Cover FX Drops” together. If you follow me on Instagram: @MissAl_Leigh you will see I don’t have great skin. I’ve seen actual breakouts clear up a lot recently since I started eating clean and exercising but I’m still left with quite a bit of dark spots and uneven texture. In an effort to appear “flawless” I use a lot of face products in my makeup routine. This works pretty well until my temperature rises any little bit and my face gets super oily, resulting in cakey, clumpy looking makeup. The Murad Invisblur Perfecting Shield is supposed to replace acne treatment medication, primer, and SPF. The Cover FX Custom Cover Drops allows foundation pigments to blend with your non-pigmented products and create custom coverage without altering the texture of the product. By combining the two, I will create a tinted acne treatment/primer/SPF that will cut down on the different types of products I’m layering on top of each other that create that cakey look. Combining these products will also be a great time saver as I’ll only be using 2 products. 13. These are just some random brand of “Metallic Flash Tattoos”. You can find official Flash Tattoos at Sephora or all sorts of brands on Amazon . I shop at Sephora too much. I have a problem…that I don’t consider a problem because the result is amazing make up products that I can play with and share here. If you’d like to see a review of any of the below products please let me know! Click the links to purchase this cool stuff for yourself! Do you own any of these products already? If so, please tell me what you think in the comments below! Thanks for stopping by! Mini Review – Beautifully Disney: Fantasy in Flight! You may be wondering if such a thing exists. When you work for Disney and get 40% off stuff during the holidays….yes…Disney hauls DO exist. I personally didn’t walk away with too much stuff, however, I did come away with two products from the newest collection from “Beautifully Disney” cosmetics line. This newest collection is focused on Disney fairies. Personally I think they could’ve shown some of the other fairies. They skipped any and all fairy godmothers. The main faces are Tinker Bell (of course) from Peter Pan, and The Blue Fairy from Pinocchio. Anyways, I picked up the Fantasy in Flighty Eyeshadow Palette ($36.95) and the 4 Nail Polish Mini Set ($21.95). They also had a brush set that looked really nice, but I have a ton of brushes already and I wasn’t sure what their quality was. They also had some new blushes that were really pigmented, but they had faces of villains on the front, and I didn’t want that. So anyways, here’s the pictures and some thoughts on what I’ve got. Enjoy! These don’t have names on them but I think I figured out which is which based on the ingredients listed on the packaging. Look below in “Thoughts” so see what I guessed they were called. Swatches, this is with just one pass over the color pressing somewhat firmly. Nail Polish: Upon reflection I have no idea why I bought these. I have 393838 bottles of nail polish, and I really don’t need any more. I was probably stoked because with the discount these were fairly cheap. I’m annoyed because the two gold colors are pretty similar, which would’ve dissuaded me from buying them if I’d thought about it a little more at the store. I’m interested to see how the bigger pieces of glitter will actually lay once applied to the nails. I can do a full review on these nail colors if anyone would like – let me know! I’m most excited about the red color, which I believe is “Star Struck”. I’m not pleased that the names of these colors are not labeled on the bottles or labeled in any obvious way. Based on the ingredients in the packaging this is what I’ve decided – “Spriteful” is the darker gold with bigger pieces of glitter because the packaging says it has Red Iron Oxide & Yellow #5 in it. I figured the Red Iron Oxide is what made it slightly darker…? “Wish Come True” is the softer gold color because it only has Yellow #5. “Star Struck” is the red because it has Red #7 in it. Finally, “Something Sassy” is the blue because it has Violet #2 in it. I feel like a really dumb scientist right now. I hope those are right… 😦 I apologize if I’m wrong, and if anyone knows for sure the correct names I would really appreciate if you let me know! Palette: I know this is not the same line of products as the Disney by Sephora collection but I feel like they’re about the same quality, so I pretty much bought this based on what the packaging looks like lol, just like I did with The Little Mermaid palette. As you can see from the swatches, the pigmentation is mixed. I passed my finger over the colors at a medium pressure, you could see where my finger had left a trace in the shadow, yet the colors were hit and miss in terms of pigment. Perhaps with a proper make up brush and technique the pigment will go on nicely if you apply it with a patting motion. I think the colors are nice. Again, no names for these colors which makes me unhappy, but oh well. They all have shimmer in them so be aware!I’m really looking forward to trying out the white as a highlight, the rose gold next to it as a lid shade, and the copper brown in the crease. Another option would be the same highlight/crease, but using the yellow as the lid shade. For a more dramatic look, I would again use the white as a highlight, the blue (above the yellow) as my lid shade, then put the dark blue/black (above the white) as my crease color. Just some ideas! Were you inspired by any of these shades, share your ideas with me! Hello everyone! This is my new blog to accompany my new Youtube channel, MissPrincessAlLeigh – welcome! Also, once again, as I said in the video, yes, I received these items for free, but I’m not being compensated by any of the companies to talk about them, nor am I affliated with these companies. Right now I’m just showing the products and saying how I feel right off the bat, a more in depth review will follow once I’ve used the products for two weeks, but I won’t be paid for that either. Okay, here we go! Thanks! I’ll talk to you guys again soon.